This recipe is much simpler than the one I made last year – and this one is alcohol free, just in case that might be an issue. 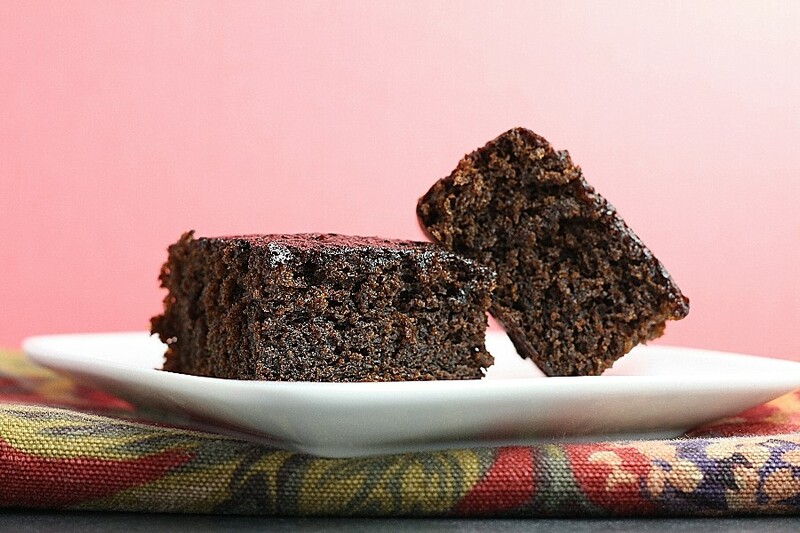 I thought this recipe was excellent – so simple to make, and it was dark, moist and full of that wonderful gingerbread flavor. I served it just as you see it, although it would also be delicious with some fresh whipped cream. The best part about this recipe? It stayed good in an air-tight container for a few days. Another reason to call this a snack cake – because usually that is the case. I hope everyone is getting prepared for the big holiday weekend – and if you need a last-minute “snack” to get you through – here it is – and just right for the season. Preheat oven to 400°F. Grease and flour an 8-inch square baking pan, knocking out excess flour. Into a bowl sift together flour, baking soda, ginger, cinnamon, and salt. In a cup beat egg lightly and stir into flour mixture with sugar, molasses, and oil. Add boiling water in a slow stream, whisking until combined well, and pour batter into pan. Bake gingerbread in middle of oven 30 minutes, or until a tester inserted in center comes out clean. What’s the deal with unsulphured molasses? Can I just use regular Brer Rabbit molasses from my cupboard? Susan, I think it should be fine, although mine is and is the same brand? I’m SO going to try this recipe, but make it gluten free and see how it tastes. I love gingerbread!! Thanks!!! How do you think the baking temperature and/or baking time would change if I used a really good toaster oven? I live in Beijing where it’s uncommon to have a fully fledged oven but we do own a toaster oven in which we can properly roast a full chicken. Thoughts? Thanks, and Happy Holidays! I think it should be the same – but I have never used a toaster oven like that before. I would assume 350 is the same no matter what you are using, right? My grandmother made a similar gingerbread at least once a week when I was growing up. It was my favorite thing to come home to after school, and I’ve been trying to duplicate it for years. She made it with Steen’s cane syrup, not molasses, and I’m pretty sure it had a little bit of ground cloves in it, but I think this recipe is very close. I pinned it and plan to try it after Christmas. Thank you. FTR, I find my toaster oven gets quite a bit hotter than my regular oven when it’s set to the same temp, and things cook faster. It may be because they’re closer to the heating element. I don’t know if lowering the temp a bit would help, but I would definitely say place the pan as far from the heating element as possible.